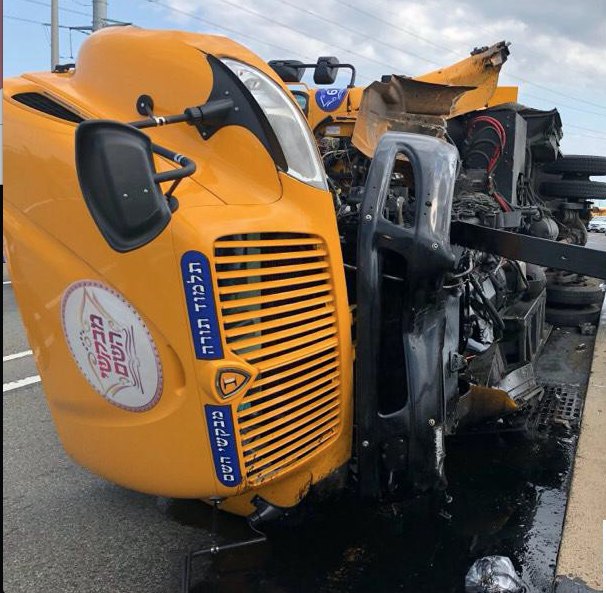 A school bus overturned on the entrance ramp to the Goethals Bridge on Thursday afternoon at around 4:00PM. 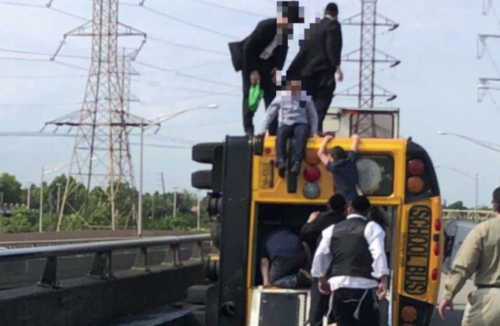 The bus was carrying children from the Mevakshei Hashem Yeshiva in Boro Park. The crash happened on the New Jersey side of bridge, on the ramp from the NJ Turnpike heading onto the bridge. Union County Hatzolah and Staten Island Hatzolah responded with multiple ambulances. The bus was carrying approximately 40 children, all of whom were able to climb out of the bus. Hatzolah confirmed to YWN that there were just a few minor injuries. Four children and one adult were taken to the hospital. Video footage from the scene (attached below) shows the children being led to another bus behind it. A third bus is seen in front of them, and is pulled over to the side. It appears that this was a convoy of three buses travelling together on a school trip.